Last Sunday I was watching 60 Minutes. In the second half of the show they had a story, “Trapped in Unemployment,” that featured an innovative program developed by Joe Carbone, who works at the state unemployment office in southwest Connecticut. All of the individuals they profiled were long-term unemployed who had already exhausted their unemployment insurance (which happens after 99 weeks of unemployment). They were former white-collar workers who were taking whatever jobs they could: landscaping, temping, etc. You can watch the video here or read the story here. The program, Platform to Employment, helps the long-term unemployed adapt to an evolving job market. They train people on topics like social media, digital footprint, and resume writing. They don't promise their enrollees jobs, but they do work with employers who offer internships that in many cases do lead to jobs. Platform to Employment’s track record is pretty solid: out of 100 enrollees, roughly 70 of them found jobs in the first year. Joe is doing noble work and I applaud anyone who is focused on helping others develop the skills necessary to be successful in today’s job market. What really stunned me about this story was the portion where they focused on a growing problem of unemployment discrimination. 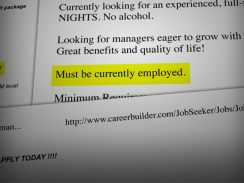 They showed a variety of job listings that included language like "must be currently employed.” Google "unemployment discrimination" and you'll find dozens of stories and examples from USA Today, Huffington Post, Fox News, etc. It's not an isolated phenomenon and it is creating biases and false generalizations that are impacting hiring. There are an infinite number of circumstances that lead to unemployment. To assume unemployed prospects are unskilled, lazy, or unmotivated because they're out of work is not just immoral and unethical – it’s prejudicial. The half dozen examples of job descriptions with this language that I saw appeared to come mostly from Craigslist. While I'm sure some of these postings came from organizations without HR or recruiters leading searches, my guess is some of them did go through internal HR/recruiting. If the language came from recruiters, shame on them. If the language was requested by hiring managers, why aren't recruiters taking a stand against this? It takes courage to say 'no'. Saying ‘no’ is difficult. Standing up to hiring managers and saying no takes balls (and may have consequences), but it’s our job to advise our clients and keep our organizations on the right path. It's our role to educate our hiring managers about best practices, processes, do's/don'ts, and to share our intuition when our experience tells us we should pass on a candidate - even after the manager has fallen in love. No one likes to hear 'no'. Broadly speaking, I think it's important that HR professionals work hard to find more ways to say 'yes' and breakdown barriers rather than create roadblocks. However, if you're ever asked to draft or post a job advertisement with language disqualifying those not currently employed - your answer should always be ‘no.’ If they don't heed that advice, it's time to find a new employer. Job Search, VideoLars Schmidt August 8, 2012 Business, Business and Economy, Cover letter, cover letter examples, Employment, how to write a great cover letter?, Job hunting, job search, Résumé, Resumes and Portfolios, what is a great cover letter?, what makes a great cover letter?